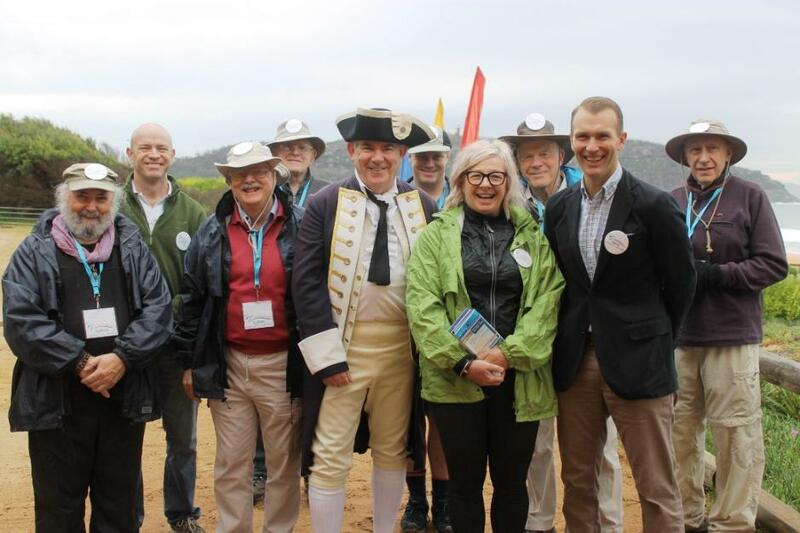 The Inaugural Sydney Harbour & Coast Walkers with Peter McKew, 'Governor Phillip (Brian Powyer) Hon. Rob Stokes and Mayor of Pittwater, Cr. Jacqueline Townsend. The Hon Rob Stokes, Minister for Environment & Heritage and member for Pittwater was at North Palm Beach SLSC on Saturday August 16 at 9am to officially start the inaugural Sydney Harbour & Coast Walk. He was joined by Pittwater Mayor, Cr Jacqueline Townsend, to farewell the first group of 10 walkers who will spend four weeks tracing the 315 km route. It will take them from Palm Beach, around Sydney Harbour, west to Parramatta, back to South Head and down the coast into Royal National Park. Auspiciously the Inaugural Sydney Harbour & Coast Walk commenced from Barrenjoey Headland and included the lightship as its first leg on International Lighthouse and Lightship Weekend 2014. As an added positive we have spoken to John Illingsworth this week, whose wonderful history films, bio films and weed eradication films we often share here, and he is accompanying the walkers throughout their 24 days of walking and 6 rest days. Mr Illingsworth will be creating another wonderful film at some stage after he and the walkers complete their adventure. Welcome today to the beginning of the Inaugural Sydney Harbour & Coast Walk. The walkers are very keen to get out and walk in the rain, there’s nothing like walking in the rain, it is fantastic as long as you have some decent wet weather gear on. My name is Phil Jenkyn, I’m one of the walkers and Chair of the Inaugural Sydney Harbour & Coast Walk Steering Committee. I’d like to introduce the Mayor of Pittwater, Councillor Jacqui Townsend. Thank you Phil. Welcome everyone, welcome to Pittwater. Firstly I’d like to acknowledge that Pittwater Council acknowledges and respects the traditional owners of this land on which we stand today. I’d also like to officially welcome Governor Phillip to Pittwater. Here we are at the official start of the Inaugural Sydney Harbour & Coast Walk. Phil and his team are to be congratulated for bringing to the attention of all this beautiful coastal walk and the fact that it actually starts here at Barrenjoey Head, which is an amazing start to any visit to Sydney. I’d like to welcome Rob Stokes, our local member and NSW Minister for the Environment, who is going to walk, regardless of the weather. I’d also like to welcome the hardy and energetic walkers who have taken on this fantastic trip for 30 days. I heard Phil speaking to Mr Marney on 702 radio (ABC) this morning and explaining how there will be a holiday aspect to this walk with many stopovers and rest days along the way. I’d also like to thank Mr. Illingsworth for taking on the job of accompanying the walkers throughout the 30 days – we will all benefit from his beautiful photography of this walk; that is something we will be able to keep and look back at for many years to come. Walking south from here you will of course see some beautiful scenery, some beautiful native fauna and flora and maybe even a few migrating whales. On the leg from Barrenjoey to Avalon I’ve been assured that will be some honeyeaters, fairy wrens hopping in and out of the shrubs and perhaps even a peregrine falcon or white bellied sea eagle. The 315 kilometre route south is a magnificent treasure to be valued and preserved into the future so that all may enjoy along this route. One thing Phil said this morning to Mr. Marney is that highlighting this coastal walk is allowing people to walk out their back door and take a stroll and be active within the community. This is something we all need to do more of and hopefully this walk will inspire others to access these beautiful areas via these paths. I’d now like to hand over to Minister Stokes to say a few words. Distinguished guests, ladies and gentlemen, it’s wonderful to be here with the Mayor of Pittwater to officially launch this amazing walk, this incredible adventure, and I as well offer my best wishes to the intrepid paedians who are about to embark an extraordinary adventure through an amazing landscape. What is so exciting about this endeavour is that it is as much cultural as it is environmental in focus. What these walkers are doing is exploding this culture that has infiltrated western society that we are not conscious of the places we inhabit; in living in a life based solely on acquisition we fail to see the beautiful places we live amongst and the wonderful people we live among. What this walk is doing in this sense is quite extraordinary and hopefully revolutionary in making us appreciate and be conscious of the amazing environment in which we live, the amazing communities that comprise Sydney and its environs and the amazing people that we can meet along the way. So much of great literature is about great journeys and about the relationships and experiences that are forged along the way, so no doubt we will see a few seminal novels come out of this journey. Quite honestly I cannot stress more strongly how important what you are doing is important culturally as it is important that we as a community do actually stop and smell the roses, that we be conscious of the people we meet, the environments and landscapes we pass and the landscapes we inhabit. These, ultimately, are much more about the tapestry of life then what we happen to acquire on the way through or what positions we happen to achieve. Those things are transitory; what remains are the relationships that we forge on the way through and our appreciation of this incredible environment. So you, the walkers, are almost like prophets telling the communities as you are passing about the importance of getting out, of enjoying our landscape, enjoying our communities, and being part of these, being conscious of these. One of my favourite sayings is from John of Sailsbury who once said; ‘Who is more contemptible than he who scorns a knowledge of himself? ’ and this indicates that in these sorts of experiences there is self-discovery as much as discovering the places along the route. I’d like to conclude by thanking everyone that has been involved in this walk and its organisation; I’d like to acknowledge and thank the many staff of OEH, the Office of Environment and Heritage who are here today; thank you for your work and support for our communities. We have some very exciting things coming up in terms of the Walk21 Conference and the IUCN World Parks Convention later this year. This event is helping to shine a spotlight on these major events coming to Sydney. This is a wonderful way to celebrate this incredible environment that we’re privileged to share together. I would, along with the Mayor, like to offer my best wishes to all the workers and to Phil Jenkyn who has led this movement in Australia. I hope to see many more walks opened up – we certainly have many more opportunities for walks in this country, disused rail lines being one example; I’m very keen to see how we can facilitate those being provided so communities have more places where they can relate to each other and enjoy this special continent that we share together. I’d like to thank you Minister and Mayor for the words that you have said both in relation to the walk but also regarding the purpose of it and who we meet and what we see along the way. I’d also like to present both of you with a special badge we have to commemorate the walk, as both of you are inaugural walkers today and we’re very pleased to have you with us. We also have for each of you a full set of the guides for the legs of these walks that have been signed by the walkers. I’d like to ask the inaugural walkers to join us so you may see how young and fit they are. This is Bill Avery, who in his spare time over the last 20 years has forged a link between Sydney, Melbourne and Adelaide. The walkers are Leigh Shearer-Heriot, Ian Napier, Bill Avery, David Eager, Charles Pitsillidi and Matt McClelland. I’d also like to present to Peter McKew with these as well. Peter is Executive Officer of the Premiers Council for Active Living and the Chair of Walk21, which to us is important as Walk21 has the potential to take walking to a new level and give every community a legacy akin to why we are doing this walk, to raise the profile of walking and all the benefits that stem from it. I’d like to thank Graham Howard (President of North Palm Beach SLSC) and the North Palm Beach Surf Club for having us here today. This is the best known surf club in the world – known overseas and in 100 countries around the world as The Summer Bay Surf Club. They have just completed wonderful renovations and have been very welcoming to us today. One of the aims for this walk is not only promote the Walk 21 Conference and the IUCN World Parks Convention but also to really encourage people to walk this route. We don’t expect everyone to walk for 24 days and 30 overall but it will become a Rite of Passage to many people, I have no doubt about that. We do however encourage people to walk for 30 minutes or an hour or two hours; to get out of their houses and drip down on to this foreshore track, and then try a different section, and then be bold enough to take a weekend off and stay in one of the lovely places along the way. For all those who want to follow where we will be the itinerary of available on the website of www.walkingcoastalsydney.com.au and the Sydway app. I will say this; we will always be on time at the start of each day and there’s a good chance that we’ll be at the lunch spot on the itinerary – the other timings may be a bit fudgy depending on how we are going along the way. The Sydwya App can be used by everyone on any of these walks. I would also like to thank the partners, sponsors and supporters – the list of Councils, and various bodies who have come on board indicate a good future for these walks and the areas they pass through. What we are walking on is 40 thousand years plus of history – we are walking on Aboriginal Tracks that have been passageways for thousands of years before the white man ever came here. What we want to emphasise as the inaugural walkers is that we are walking for our WHOLE history and culture of 40 thousand years +. Part of this is of course colonial. I have noticed that today, somehow, Governor Phillip has come back after two hundred years to visit a place where his life and person are celebrated, here in Governor Phillip Park. Why have I come back today? It is important for me to visit special places – this happens to be one of those special places, and it is special because of the strong bond and friendship I made with the Aboriginal people at that time. There were very few wqhite people in these areas, in fact there were none – however I was very impressed by the Aboriginal peoples of these lands; slender of body, quick of mind, and very open and wiling to show us the way. We spoke of the various aboriginal tracks and we in fact engaged in using those tracks to find our way to this very location. I actually made three trips to this area in my time. The first was by boat and had I ventured for another day or two I would have declared The Pittwater and Brisbane Waters as the site for the settlement; it is actually a better waterway then in Sydney Cove or Port Jackson. However, I did not find enough fresh water. On another journey of course, I found the Hawkesbury, and had I travelled the distance at that time, that is where I would have made the settlement. So this place is important for those reasons. I also wish to thank those who have honoured my name and my person by naming this park The Governor Phillip Park, in fact, I feel quite humbled. My job was to start the colony; I didn’t come for statues or memorial parks. We had a mission and my vision for this great nation is enhanced today by this gathering. This is what I believed would happen in this great colony, that we would have free people enjoying an environment that is unrivalled anywhere in the world. These are just some of the reasons that I have ventured here today. In my comings and goings I have made a great bond of friendship with Mr. Jenkyn and so would like to thank him on behalf of all of you and all of the citizens of this great city for the work that he has done in putting these paths and tracks together. Thank you Governor – I have to say that the paths and tracks have been put together by many many people and represent a wonderful relationship between Councils, Government and a city all pulling together to create an irresistible force. The Inaugural Sydney Harbour & Coast Walk will take place from August 16 to September 14 (with five rest days). It will highlight the full breadth of Sydney's history, and emphasise the tourism, recreational, health, environmental and economic benefits that the walk can bring. The steering committee organising and promoting the walk includes representatives from The Walking Volunteers, National Parks Association of NSW, Sydney Coastal Councils Group, Department of Premier & Cabinet, Department of Planning & Environment, National Parks & Wildlife Service, Department of Health, Destination NSW, Sydney Harbour Federation Trust, Heart Foundation, Walk2l, Wildwalks and Land's Edge. Sydney’s coastline and harbour represent one of the most beautiful and environmentally diverse attractions in the world. The coast features cliffs, beaches and inlets of magnificent beauty unique to the region. The harbour offers iconic headlands, historic sites and national parks. Outlined in the attached maps and brochures is a continuous walking track that residents and visitors can utilise to explore the beautiful foreshores of Sydney. Phil Jenkyn, of The Walking Volunteers said a lot of "blood, sweat and tears" had gone into making this dream walk a reality. But the effort had been well worth it. "What other city in the world has such a fantastic and expansive harbour and river system, bordered with natural bushland, historic areas, maritime remnants and a modern city - all there to be experienced for free! "We want people to use this foreshore walk, to enjoy it, to share it with visitors and friends, and to value and preserve this amazing treasure." Phil is the Chair of the Inaugural Sydney Harbour & Coastal Walk Steering Committee. He has been a member of The Walking Volunteers, a small group of experienced walkers, since 2004. He is also a member of the National Parks Association of NSW. In 2003-2004 he was involved in developing walks in Hunters Hill. He worked with Leigh Shearer-Heriot and other members of The Walking Volunteers in developing the first edition of the 'Harbour Circle Walk' (2004-2005); was responsible with Leigh for the three Northern Beaches maps and brochures (2006-2008) and the two Parramatta River Walk maps and brochures (2009-2011). He handled with Bill Orme applications for grants, funding for printing and distribution of brochures. He organized the four day 'Harbour Circle Walk' (Sept 2005), the seven day 'Sydney's Great Coastal Walk' (July 2008) and the 'Governor Phillip Walk' (Sept 2011). Phil is a retired barrister and former Hunters Hill Councillor. He has been involved in many environment and heritage issues and was the Foundation Chair of Defenders of Sydney Harbour Foreshores and the Joint Convener of Protectors of Public Lands. He is a member of the Sydney Harbour Federation Trust Community Advisory Committee (2002-2014) and the Sydney Harbour National Landscape Steering Committee (2012-2014). He was awarded an OAM (2005) for services to the protection and preservation of the environment and in 2010 received the National Trust's Lifetime Achievement Award for his contribution to heritage conservation. Leigh has been a member of The Walking Volunteers since 2004. He worked with other members in developing the first edition of the 'Harbour Circle Walk' (2004-2005) and was responsible with Phil Jenkyn for the three Northern Beaches maps and brochures (2006-2008) and the two Parramatta River Walk maps and brochures (2009-2011). Leigh was co-founder of the Great North Walk between Sydney and Newcastle and contributed to the development of the Federation Track between Sydney and Melbourne. He is the organizer of the Wombat Walking Group since 1989, and has been a volunteer guide for Marrickville, Canterbury and Strathfield Councils' Regional Riverlife Program. He is the driving force behind a proposal by The Walking Volunteers to identify the most appropriate walking route, with linking regional routes, through Western Sydney from Parramatta to the Blue Mountains. This will connect Sydney Harbour National Landscape to the Greater Blue Mountains National Landscape, thereby linking the walking routes in both Landscapes. Ian is an architect planner and urban designer specialising in pedestrian planning. He was a founding director of the Pedestrian Council of Australia and is a Board Member of Walk 21, an organisation presenting international conferences on walking issues. He has been involved in bringing the conference to Sydney this year. Ian prepared a Pedestrian Network Plan for North Sydney Council in 1999. This plan later came to the attention of Bill Orme who was researching a Circle Walk of the municipality with a small group of like-minded walkers. Ian joined and in 2004 the group expanded and became known as The Walking Volunteers. He worked with Dominic Adshead and Bill Orme on the 2010-2011 update of the `Harbour Bridge to Manly via Spit' map and brochure and in 2012 took on the role of Convenor of The Walking Volunteers. Ian is the author of an illustrated book of walks called `Step out East' that was published shortly after the Eastern Suburbs Railway line was opened in 1979. Bill became involved with the Walking Volunteers in 2006 and was responsible with Bill Orme for the 'Clovelly to Cronulla' map and brochure. He also prepared the historical information and background notes for that brochure as well as a Track Guide for the walking route from Barrenjoey to Port Hacking. Bill is a retired business executive. He is the pioneer of the Federation Track, a 3,000 km bushwalking route from Sydney to Adelaide that connects the Sydney Harbour National Landscape to the southern end of the Greater Blue Mountains National Landscape, the Australian Alps National Landscape and the Great Ocean Road National Landscape. He has proof-walked, documented and way-pointed this route and is currently working on a series of e-guides for Federation Track West from Melbourne to Adelaide. He is the author of 'The Federation Track - Circular Quay to Stanwell Park' and the e-guide "Federation Track West I - Melbourne to Twelve Apostles" which is available from Apple, Amazon and Kobe. More information on the Federation Track (including GPX files of the route) is available from federationtrack.com.au. 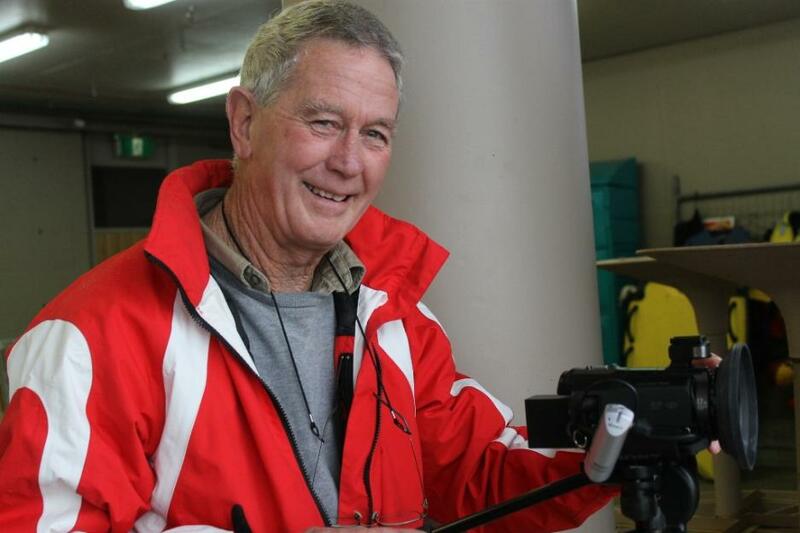 David is a member of The Walking Volunteers and the National Parks Association of NSW. A resident of Braidwood he is now retired with a business, management and public sector background. He has organised and led from the 1970s to the present walks on the Central Coast, Southern Highlands and Braidwood area, including in Budawang and Monga National Parks. In the 1980s he organised a local walking group based on the lower north shore of Sydney exploring and researching Sydney Harbour and the northern beaches. He participated with Leigh Shearer-Heriot and Bill Avery on proofing walks on the Central Coast and in the Sydney area in the 1990s. David has completed many long distance walks including Indonesia (Mt Rinjani in Lombok 1987); Australia (Walhalla to Melbourne 1993), (Newcastle to Poiblue - Barrington Tops 1995); Africa (Mt Kilimanjaro 2000) and Canada (British Columbia 2000, 2003 and 2010). He is a former chair of Central Coast Community Radio and was involved in the formation of community radio for the region. Charles became involved with the Walking Volunteers through his participation in the seven day 'Sydney's Great Coastal Walk' (July 2008) from Barrenjoey to Cronulla and the Royal. As an ongoing contributor to the Walking Volunteers he has both explored new options, and proof walked existing routes within Sydney's walking network. He was part of the inaugural Great North Walk in 1988 and was a foundation member of the Wombat Walking Group that grew out of that event. He also participated in several sections of the Federation Track between Sydney and Melbourne. Now retired after a career in design and engineering of high speed manufacturing equipment, Charles has personally mapped the walking track network within the Parramatta, Castle Hill, Seven Hilts triangle. He is also an active supporter of the project to develop a walking route between Parramatta and the Blue Mountains. Matt lives in Hornsby with his wife Fiona and two primary aged kids. He is the author of four bushwalking guide books and runs two popular bushwalking websites serving around 5000 people each day (wildwalks.com & bushwalk.com). He is also the Activities Coordinator for National Parks Association (NPA) of NSW managing the program of around 1000 walks per year. The NPA is a conservation group, the lead organisation for the inaugural Sydney Harbour and Coast Walk as well as Australia's largest bushwalking club. Most weeks he features on the "Weekend walkers guide" on ABC regional radio and is occasionally heard on ABC 702 and ABC statewide. Matt is passionate about helping protect native landscapes by encouraging a love for wild places within our community. He is also passionate about helping kids connect with nature. He built plavfulpossum.com to help families discover the thousands of playgrounds scattered around Australia. Free play is an important part of growing up helping people develop physically, neurologically and socially. He is a keen advocate of inn-to-inn walking. This is an idea of enjoying multiday bushwalks whilst staying in B&B's. In writing his books on the Great North Walk and the Six Foot Track he included details on how to complete these longer walks as either day walks, tent walks or inn-to-inn. Matt is excited to be a part of this inaugural walk and is looking forward to being a tourist in his own city for a month. Pittwater's John Illingsworth - at work.